Kyle Grillot - kgrillot@shawmedia.com C.J. Fiedorowicz talks with Houston Texans general manager Rich Smith and coach Bill O'Brien as he is the first picked in the third round of the NFL draft Friday in Johnsburg. Kyle Grillot - kgrillot@shawmedia.com C.J. 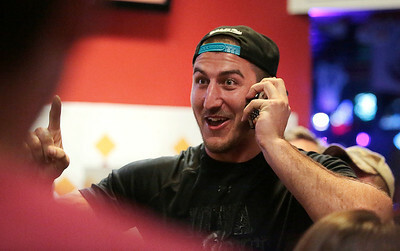 Fiedorowicz and his mother Leeann celebrate with friends and family inside Raymond's Bowling Friday in Johnsburg after Fiedorowicz was picked by the Houston Texans in the third round of the NFL draft. Kyle Grillot - kgrillot@shawmedia.com C.J. Fiedorowicz motions to his friends while he talks with Houston Texans general manager Rich Smith and coach Bill O'Brien as he is the first picked in the third round of the NFL draft Friday in Johnsburg. Kyle Grillot - kgrillot@shawmedia.com C.J. Fiedorowicz talks with Houston Texans general manager Rich Smith and coach Bill O'Brien while Raymond's Bowl customers operate a ticket machine Friday in Johnsburg. Kyle Grillot - kgrillot@shawmedia.com C.J. 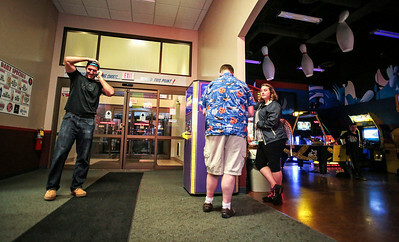 Fiedorowicz hugs his mother Leeann while celebrating with friends and family inside Raymond's Bowling Friday in Johnsburg after Fiedorowicz was picked by the Houston Texans in the third round of the NFL draft. Kyle Grillot - kgrillot@shawmedia.com C.J. 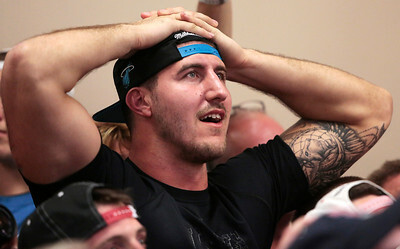 Fiedorowicz waits for his name to appear on the television after talking with Houston Texans general manager Rich Smith and coach Bill O'Brien. 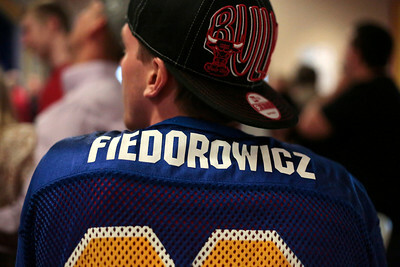 Fiedorowicz is the first picked in the third round of the NFL draft Friday in Johnsburg. Kyle Grillot - kgrillot@shawmedia.com C.J. Fiedorowicz looks to check for cellphone reception after talking with Houston Texans general manager Rich Smith and coach Bill O'Brien as he is the first picked in the third round of the NFL draft Friday in Johnsburg. Kyle Grillot - kgrillot@shawmedia.com Leeann Fiedorowicz looks to the televasion displaying her son's name is shown after he spoke with Houston Texans general manager Rich Smith and coach Bill O'Brien. 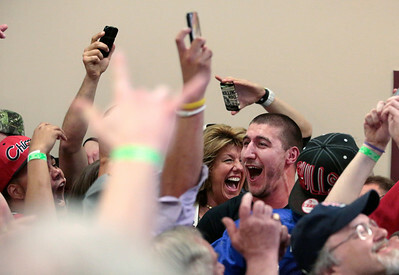 Fiedorowicz is the first picked in the third round of the NFL draft Friday in Johnsburg. Kyle Grillot - kgrillot@shawmedia.com C.J. 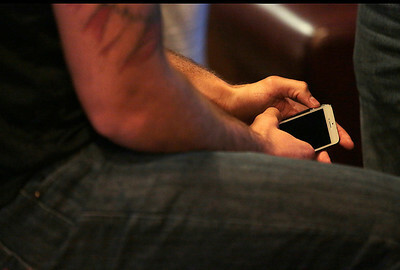 Fiedorowicz holds onto his phone while waiting for the call to be drafted into the NFL at Raymond's Bowling Friday in Johnsburg. Kyle Grillot - kgrillot@shawmedia.com C.J. Fiedorowicz is surrounded by friends after tackling him in celebration outside Raymond's Bowling Friday in Johnsburg after Fiedorowicz was picked by the Houston Texans in the third round of the NFL draft. Kyle Grillot - kgrillot@shawmedia.com C.J. 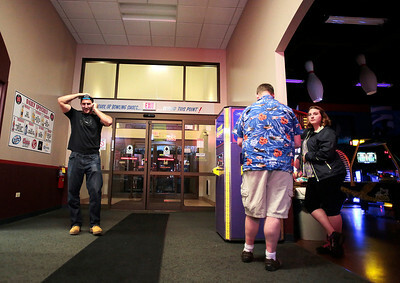 Fiedorowicz talks with friends and family while waiting to be drafted into the NFL at Raymond's Bowling Friday in Johnsburg. Kyle Grillot - kgrillot@shawmedia.com Hayden Cavenaugh of Johnsburg, wearing C.J. Fiedorowicz' senior year practice jersey from when he played at Johnsburg, waits with friends for Fiedorowicz to be selected at Raymond's Bowling Friday in Johnsburg. C.J. 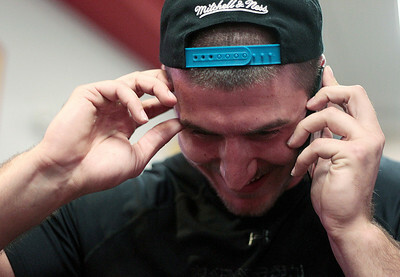 Fiedorowicz looks to check for cellphone reception after talking with Houston Texans general manager Rich Smith and coach Bill O'Brien as he is the first picked in the third round of the NFL draft Friday in Johnsburg.